Developing the Core by NSCA covers assessment, training principles, and programming for strength and stability for maximal sport performance. Describe core anatomy and biomechanics and how the core musculature influences an athlete’s ability to create efficient movement. Use a variety of testing and assessment tools to evaluate a person’s core strength and stability. Identify how the training principles of overload and progression are key factors to consider in prescribing core exercises. 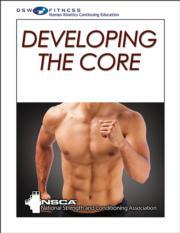 Implement guidelines for developing core strength and stability in designing effective sport training programs. Describe a variety of exercises and drills to develop core strength and stability in order to improve athletic performance. Design safe training programs for core development to meet specific goals for a variety of sports and activities.